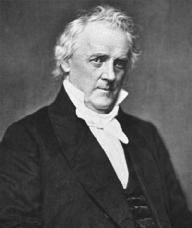 James Buchanan achieved prominence as a statesman and as the fifteenth president of the United States. Buchanan was born April 23, 1791, near Mercersburg, Pennsylvania. A graduate of Dickinson College in 1809, Buchanan was admitted to the Pennsylvania bar in 1812 before serving a tour of duty in the militia during the War of 1812. After the war, he entered politics and joined the Pennsylvania House of Representatives in 1814. In 1821 Buchanan began his career in federal politics, representing Pennsylvania in the U.S. House of Representatives until 1831. Later that year, he extended his interests to the field of foreign service and performed the duties of U.S. minister to Russia for a two-year period. He returned to Congress in 1834 and represented Pennsylvania in the U.S. Senate for the next eleven years. From 1845 to 1849, he served as U.S. Secretary of State and reentered foreign service in 1853 as U.S. minister to Great Britain until 1856. Buchanan became unpopular in 1854 with his involvement in the creation of the Ostend Manifesto, which provided for the purchase by the United States of Cuba from Spain; if Spain refused to sell, the manifesto gave the United States the right to seize the country forcibly. Cuba would then become a slave state, which was viewed favorably by Southerners, but which met with vehement opposition by abolitionists. The manifesto was eventually rejected by the U.S. department of state. As a presidential candidate in 1857, Buchanan adopted a moderate attitude toward Slavery and worked to establish a balance between the proslavery forces and the abolitionists. He believed that slavery was immoral, but that the Constitution provided for the protection of the practice in areas where it already existed. New states, he believed, should have the right to choose whether to be free or slave. "What is right and what is practicable are two different things." He won great support from the South, and after his election in 1857, Buchanan unsuccessfully attempted to reconcile the strife between the warring factions. He again advocated the acquisition of Cuba and favored the admission of Kansas as a slave state, which earned him disfavor with the northern free states. The strife between North and South continued, and Buchanan was unable to prevent the secession of South Carolina that led to the outbreak of the Civil War. He opposed secession but believed that he did not possess the power to compel states to remain faithful to the Union. When Abraham Lincoln succeeded Buchanan as president in 1861 the country was ready for civil war. Buchanan retired to Pennsylvania where he died June 1, 1868, in Lancaster. Buchanan was cleared of murder but convicted of manslaughter at Canterbury crown court. It is not an "intellectual biography" of Buchanan in the strict sense, and Wagner is clear on this. Buchanan retains an affection for Nixon, but he makes it clear that Nixon was "no Goldwater, no small-government, anti-New Deal libertarian conservative. What would have been observed and felt had we seen these works with more examples of the cast-concrete "Frustula," 1978-81, sculptures as Buchanan developed them in the late '70s in New York and as her formal and material vocabulary continued to develop in the years following her return to Georgia? Shade inspects Buchanan and Northern opinion on disunion from December 1860 to March 1861 and finds that Buchanan did not differ from members of his party. We're losing some key pieces, but we're having some key pieces coming back,'' Buchanan said. As Buchanan told the story, the slim volume (Finanztheoretische Untersuchungen [Investigations in public finance]) would not have been available to him had he not learned German as a requirement for the completion of his degree at Chicago. Buchanan described it as the 'best goal I ever scored - and a go for broke shot', while stunned Swansea manager John Toshack ranted at his players for 20 minutes after the final whistle. Buchanan was not entitled to any of the three forms of innocent spouse relief available under Sec. In a memorable outburst in 2007, Warne called Buchanan a "goose" and said players had to put up with his "verbal diarrhoea" during his nine years in charge of the Australian team. If a cable news program is on in the background and you hear the words "Agincourt" or "the snows of Canossa," it is Buchanan, inevitably, speaking them. Unless you think Buchanan is a dangerous, hateful, racist monster, that is.